The FLIR GF320 is an IR camera for optical gas imaging that visualizes and pinpoints leaks of VOCs, without the need to shut down the operation. The portable camera also greatly improves operator safety, by detecting emissions at a safe distance, and helps to protect the environment by tracing leaks of environmentally harmful gases. The camera contains a cooled Indium Antimonide (InSb) detector. This highly sensitive detector, that operates in the 3.2 - 3.4 micrometer waveband, not only visualizes VOCs, but also the makes the smallest of temperature differences in a plant or process clearly visible. Visualizing temperatures from -40 to 350°C the FLIR GF320 is the perfect non-invasive inspection tool for monitoring industrial settings such as oil refineries, natural gas processing plants, offshore platforms, chemical/petrochemical industries, as well as biogas and power generation plants. 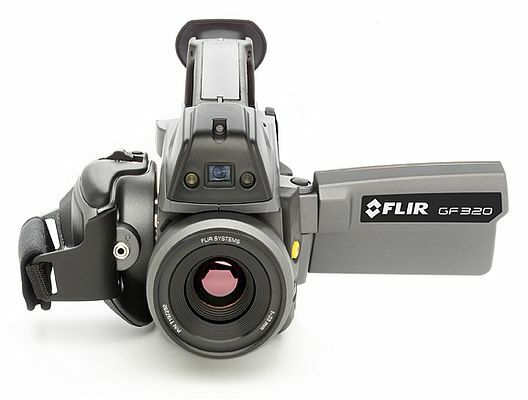 The FLIR GF320 comes either with a fixed 14.5° lens or with a fixed 24° lens. A version with interchangeable lenses is also available but requires a US Department of State license. designed to provide the best thermal measurement performance together with the most advanced connectivity.